Youth Growth Tonic - Ways To Become Taller Youth Growth Tonic – Tall Pro – Does This Powder Formula Really Work? Youth Growth Tonic – Tall Pro – Does This Powder Formula Really Work? Youth Growth Tonic – Tall Pro – Does This Powder Formula Really Work? While I was doing some researches on the internet for some “powder” height formulas, I was able to stumble across the Youth Growth Tonic – Tall Pro item. Yes, it claims to boost the height growth for all folks on the puberty stage! Youth Growth Tonic – Tall Pro was found in the Online Indian Market as well, which they do sell several other height growth products. This form of powder shares many benefits to gain while using this formula! But that’s not the case, here’s a full article for details on all about Youth Growth Tonic – Tall Pro product! What Is Youth Growth Tonic – Tall Pro? This item is a height increasing formula found promoting to help enhance the height growth of all teenagers. Instead of pills, tablets, or liquid form of methods, Youth Growth Tonic – Tall Pro is a powder product! Which, basically you would add the recommend amount of powder to a beverage drink and take it. 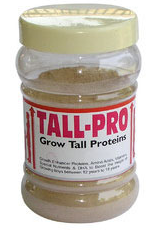 Youth Growth Tonic – Tall Pro should be completely natural and safe for all users to gain more stature. We actually have come across a webpage to share that the (Dr. Sabharwal’s Wound Care) is who manufactured this “height booster” product, located in Panchkula, Haryana, India. This brand has been in the industry since 2005, selling a variety of health products. Follow down to find out on all about their height growth item! The Youth Growth Tonic – Tall Pro formula is basically a “protein” enhancer, who claims to carry all natural compounds in a proprietary blend. Therefore, the promoting website mentions to carry some of the ingredients, such as “freeze dried carrot, tomato powder, wheat bran, ashawagandha, brahmi and bringhraj“, with DHA, amino acids, proteins, vitamins, and nutrients all in one formulation. Perhaps, the product’s company does share to contain no type of chemical or harmful compound included in the Youth Growth Tonic – Tall Pro item. That means, it should be free from steroids, animal product, and hormones, such as HGH hormone. Other than that, it does not say about how it works, or how to intake the product’s powder. According to them, Youth Growth Tonic – Tall Pro supplement is for adolescent teenagers from ages of 12-18 years old. That’s when these children grow the fastest and most, due to being on puberty stage. Not only this height enhancer promotes to help boost up the growth of stature in all teenagers to grow much faster, but they share several other benefits as well. It should improve mental function and boost up brain power, plus support the cells in the brain. They also mention to “give strength to internal body organs“, but for the bone growth? It says nothing. Keep reading! Youth Growth Tonic – Tall Pro was found with no primary official website, but as I mentioned earlier, it’s only available in the India Mart retailer. For a price, it’s one of those items out there that you’ll need to contact them and ask for a price if you were interesting. And you do that by clicking on the tab, it pops up a form of email, then you send them an inquiry relating to the product. Now, I do know that most products from India, they accept Cash at the location it gets delivered and for a money back guarantee? Your best choice would be to ask them if you were ever interested in buying a product like this! Read on for my personal conclusion! For a fact, there are too many products claiming to increase “height” in the India market and not all of them backs up the promises and claims. Where this item is one of them! Youth Growth Tonic – Tall Pro being on this online shop retailer, it shows no form of evidence whatsoever. We are unable to find any reviews from real consumers to mention about their personal usage and experience with the product, there is no medical endorsement to approve and recommend this “height booster” item. Clinical trials and scientific studies? The small brief paragraph about the Youth Growth Tonic – Tall Pro formula, it failed to mention anything about being clinically proven or have any evidence to back it up. Perhaps, they even failed to share the full ingredient’s list of each compound included, it also failed to mention on how the product really works and how do we take this powder item? We don’t know, which makes it hard to just send them money without knowing this unknown important information in my opinion. Thereby, let me throw you the right destination to really increase your height. It’s not only from my words but real customer users out there are claiming to have gained inches in height! Yet, Growth Factor Plus offers some evidence to back up, such as before-and-after results from reviews, etc. Growth Factor Plus is one of them from many folks out there asking questions if it really works as it promises, which is one of the only ways to actually boost up our natural height. And if you’re an adult like me, with the growth plates fused, it works as well, since it’s Growth Factor Plus is an effective formula of pills to quickly drink the vials. Now for the Youth Growth Tonic – Tall Pro item, if you have a different opinion and thoughts? I would love to hear it from you! So, all you would have to do is drop a line below in the box there. I would make sure to get back to you as soon as possible. 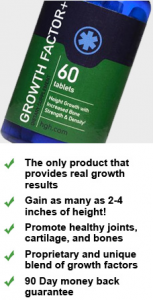 Grow Taller Pill Review – 1-6″ Inches of Growth in Height? Really? Consumers Found!